Christmas and New Year are very special times for every one us... probably because for many of us it represents a new beginning. A new start, an opportunity to release old that holds up back. And even the energy of a new start was strong in the beginning of December, the whole celebration still triggers lots of thoughts and dreams. I remember one year I wished for love. Well, I was young and have no idea that wishes come true in different ways and faces... And what love is anyway? Obviously, I wished for someone I can be truly close to, someone who will understand me deeply. Now it makes me smile with the greatest compassion for my younger self. I love you, girl, I say to my past self. Believe me, you don't need anyone else. Or simply... you can't wish for someone like this until you can't be this person for yourself. When I looked back to my wish the year after, I was shocked. I didn't find this someone back then, but the dream came true in an unbelievable, profound way. Because by the end of that year I became much closer to understanding what love is and having it. Not long after I wished for "love" on new year's night, I ended up working for a charity because of the whole restructuring that happened in the company I worked with before. It was surprising to me, but I jumped on board as I was volunteering for that charity for a while. Saing that the job changed my life will be like saying "Oh, it's a little windy" when you look at the tornado breaking trees in front of your house. I saw things the way I never saw before. I saw love and beauty where it's not supposed to live, I saw forgiveness where it never meant to be. We worked with disabled children in boarding homes who were left by their parents. The amount of love you find there is hard to compare with anything I ever saw. My heart opened to the extent I could never imagine. There was no amount of pain that couldn't be understood anymore. All the world became love to me. Because love is the only way to survive the pain. "Wasn't it a slightly too radical way to realize my wish, Universe...?!" - I asked. The next year I wished to understand my purpose... Life, aren't you teaching me anything?! One more amazing challenging year... I got my purpose, The Universe guided me. One more year to be grateful for, to reflect and say to me: "Dam... Kate, SPECIFIC. For f sake, be specific, girl.."
I think after that I was pretty specific and my new years' dreams came true the way I wanted them to. I can't be more grateful and blessed to have this relationship with the Universe. Not to say "Why are you doing this to me?! ", but repeat: "What is your gift here..? How are you elevating me in this situation...? What is that I need to see...?" But I am not in anyway special. The truth is I just learned and built my bond with the Universe the way anyone can do it. This sentence probably summarizes why of all the work I do. To help you have the most loving, happy and meaningful relationships with yourself and with the world. 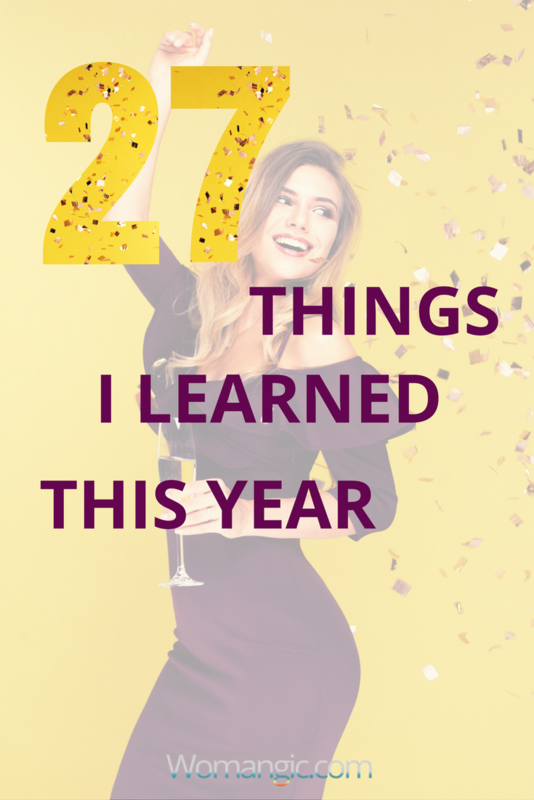 On this note, I want to share with You 27 (my magical number) things I learned this year. A little bit about love, making dreams come true, letting go and balance. 1. Where is Life, there is Love. 2. Lack of love or abundance is the illusion we create because we don't want to let go ideas we had for so long. 3. Sometimes letting go a belief feels like giving away part of the body. Physical. 4. When you' drown in pain it's not always a bad thing. Sometimes you need it for healing. 5. When you feel like you need to change something in your life, don't doubt it. 6. Touch the sky with your feelings and it will answer you back. 7. When you don't know what to do, keep silent. Keep silent. The answer will come. 8. If You set the intention for anything you do, your life will transform. 9. Your body is taking care of You. Not the other way around. 10. Appreciate thousands of processes your body does for you in just ONE second and support it. 11. When you accept life in all its forms both negative and positive, it gives you peace. 12. We can let go when there are no more lessons to learn. Look for them until you feel peace. 13. You're not responsible for others' happiness. Period. 14. If you exhaust yourself doing something for others, it will never be appreciated. 15. When you really want something and ask Universe to help with it, make sure you believe that you deserve it first. 16. If your dream hasn't come true yet, don't question Universe, question your beliefs. 17. Know, that what you want waits for you in the space and time as soon as you clear the corridor of "not good enough" "not sure it's possible" "others come first". 18. If you really, really want to commit to helping and serving other people, always put yourself first. 19. If you feel like you need to get tired to be truly helpful, check with yourself and others. 99.99% chance it is not needed. 20. Only a woman in joy can truly love. 21. Don't, just don't have serious conversations when you're tired. Rest. 22. Best work comes when you're balanced and rested. 23. Meditation is the key. Key to all doors. Period. 25. When you're puzzled, take a break. Breathe. Walk. Pause. 26. Self-love isn't just essential, it's an oxygen for all relationships in your life. 27. Magic happens when we let go.